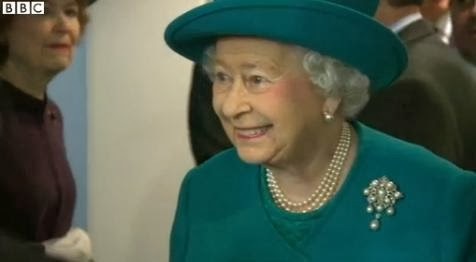 The Queen and the Duke of Edinburgh opened the new headquarters of the SSAFA armed forces charity at Queen Elizabeth House, London. They were welcomed by Prince Michael of Kent, President, and Princess Michael of Kent. Click above for a video report and article from the BBC. I just had to update my entry for this brooch - it used to ponder the reasons why this brooch wasn't more of a favorite with the Queen, but this marks the fourth appearance since this time last year. Not in the shadows anymore! Three cheers from all the pearl fans out there, no doubt. 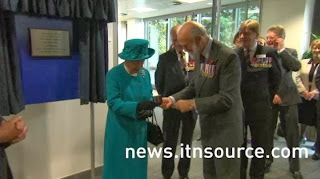 Click above for a longer video including the presentation of the Queen's badge, seen above, from ITNSource. During the visit, Prince Michael presented the Queen with a badge to mark her 60 years of service. Perhaps we'll get a glimpse the next time she has an engagement with the charity.